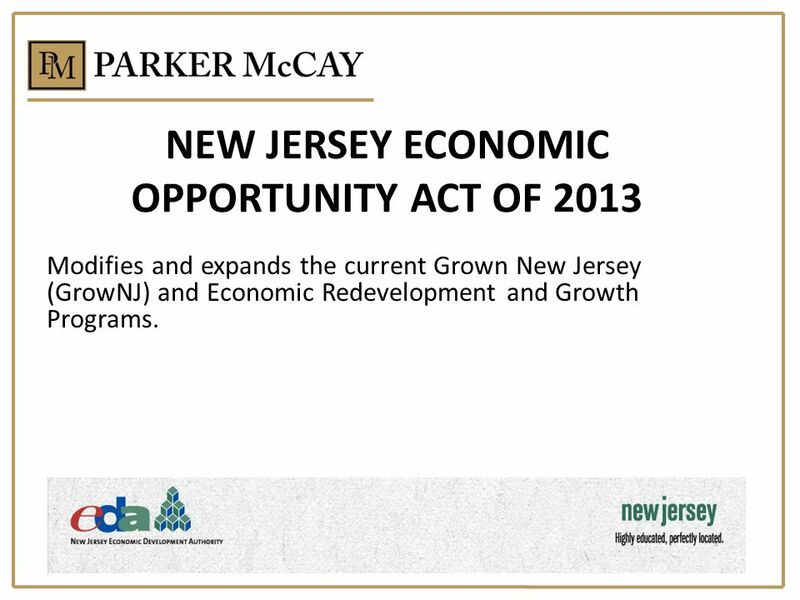 Modifies and expands the current Grown New Jersey (GrowNJ) and Economic Redevelopment and Growth Programs. 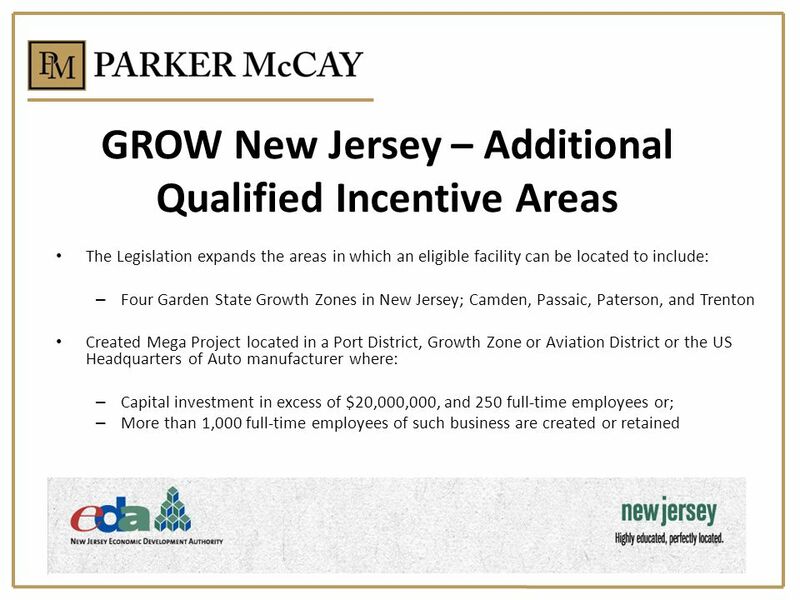 3 GROW NEW JERSEY PROGAM GrowNJ program is broadly aimed at industrial, commercial and office projects, and excludes retail facilities. 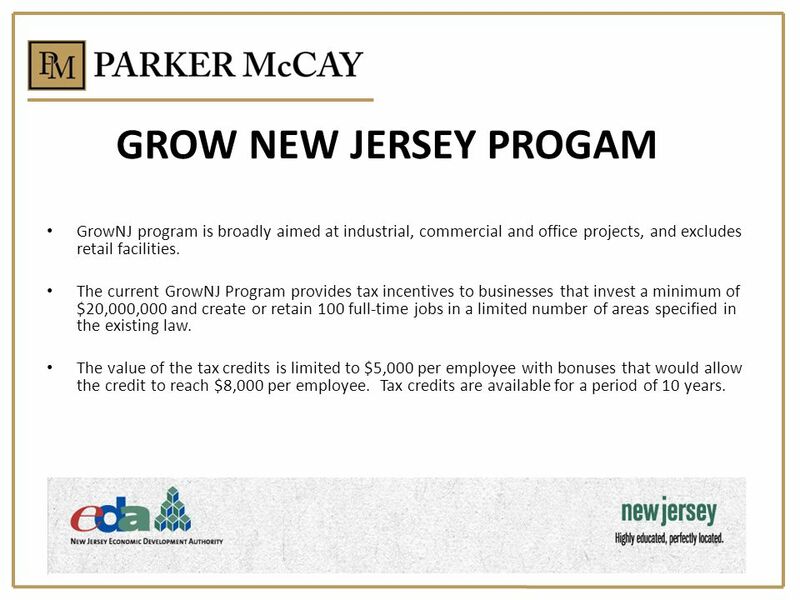 The current GrowNJ Program provides tax incentives to businesses that invest a minimum of $20,000,000 and create or retain 100 full-time jobs in a limited number of areas specified in the existing law. The value of the tax credits is limited to $5,000 per employee with bonuses that would allow the credit to reach $8,000 per employee. Tax credits are available for a period of 10 years. The Legislation requires a minimum capital investment based on the cost/sf of the project. Site acquisition (within 24 months), site preparation, construction, repair, renovation or improvement to a building, structure or facility; obtaining and installing furnishings, machinery, apparatus, or equipment; GROWTH ZONE: redevelopment and relocation costs; engineering, legal, accounting and other professional services; environmental remediation; and, infrastructure improvements including off-site utility, road, pier, wharf, bulkhead or sidewalk construction. 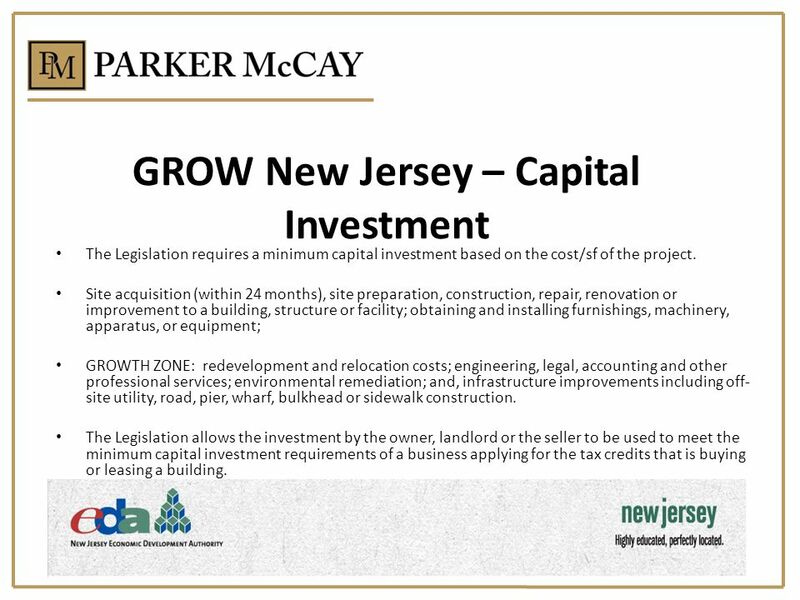 The Legislation allows the investment by the owner, landlord or the seller to be used to meet the minimum capital investment requirements of a business applying for the tax credits that is buying or leasing a building. 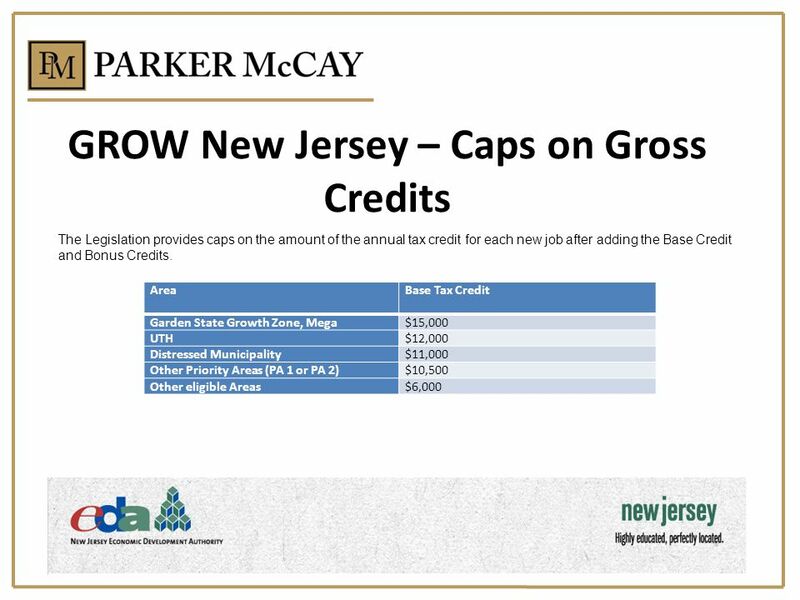 The total tax credit for each new full-time job is 100% of the gross tax credits. 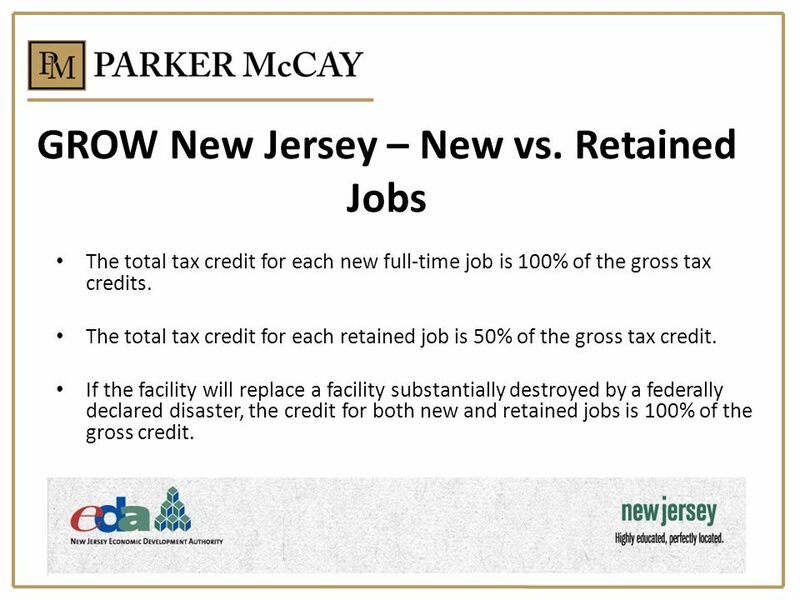 The total tax credit for each retained job is 50% of the gross tax credit. If the facility will replace a facility substantially destroyed by a federally declared disaster, the credit for both new and retained jobs is 100% of the gross credit. 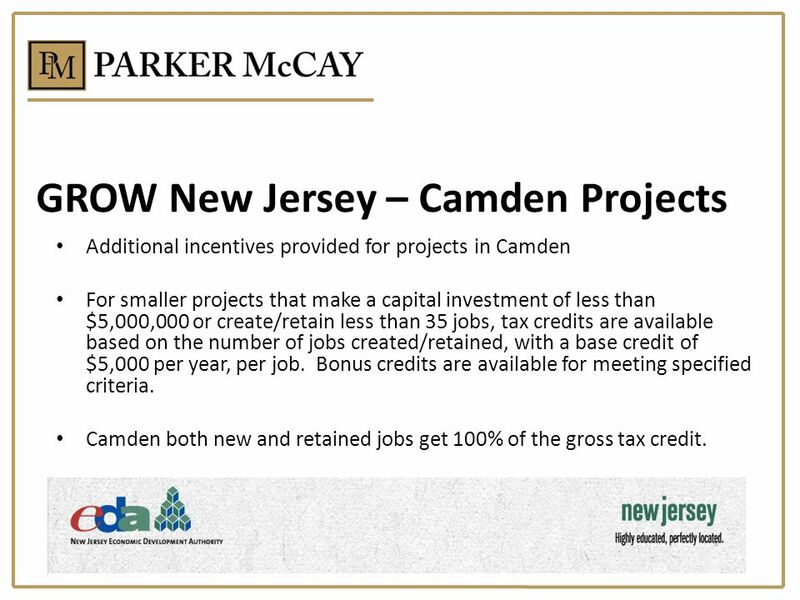 Additional incentives provided for projects in Camden For smaller projects that make a capital investment of less than $5,000,000 or create/retain less than 35 jobs, tax credits are available based on the number of jobs created/retained, with a base credit of $5,000 per year, per job. Bonus credits are available for meeting specified criteria. Camden both new and retained jobs get 100% of the gross tax credit. 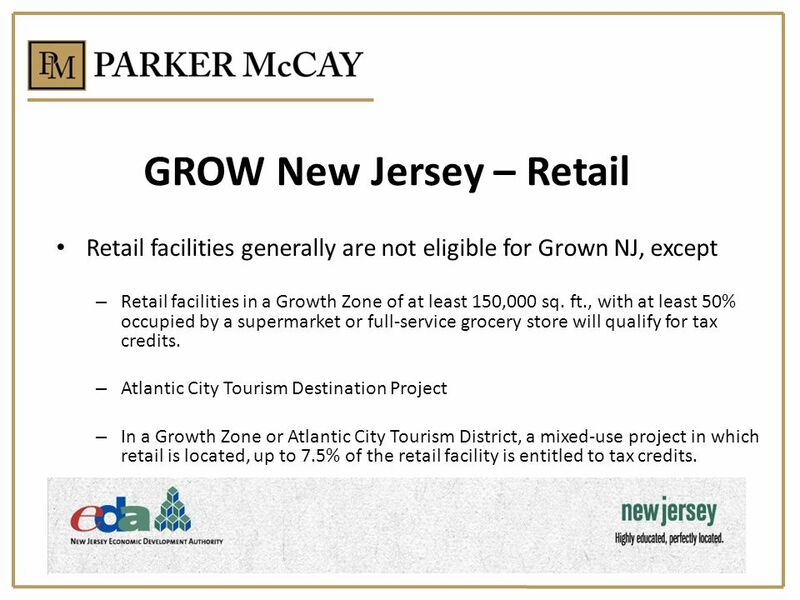 Retail facilities generally are not eligible for Grown NJ, except Retail facilities in a Growth Zone of at least 150,000 sq. 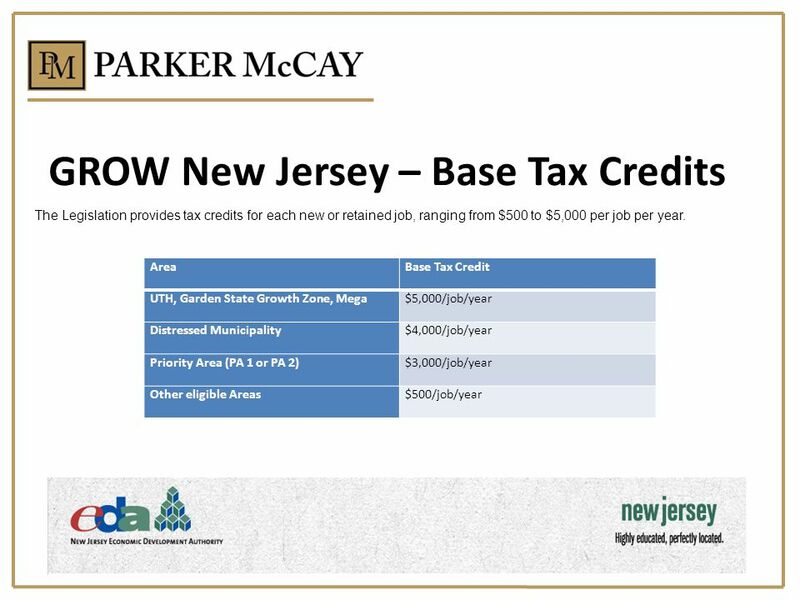 ft., with at least 50% occupied by a supermarket or full-service grocery store will qualify for tax credits. 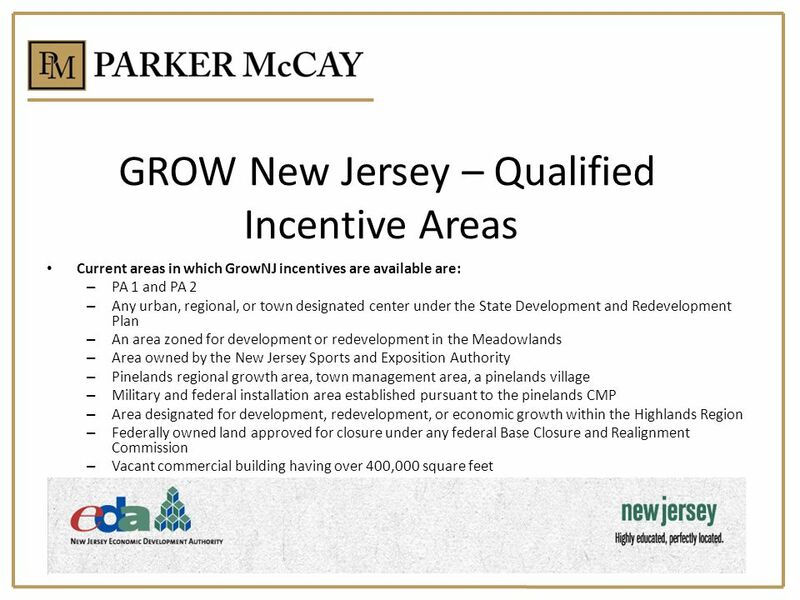 Atlantic City Tourism Destination Project In a Growth Zone or Atlantic City Tourism District, a mixed-use project in which retail is located, up to 7.5% of the retail facility is entitled to tax credits. 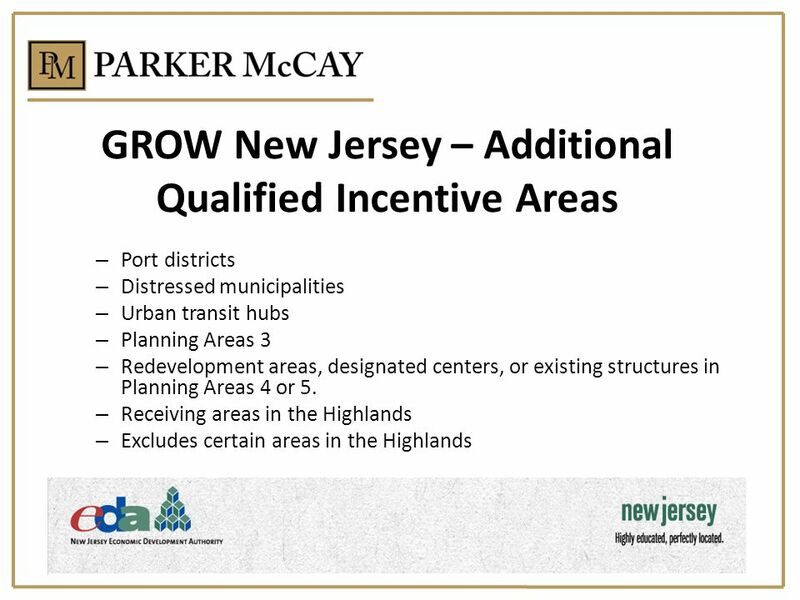 18 GROW New Jersey – Misc. 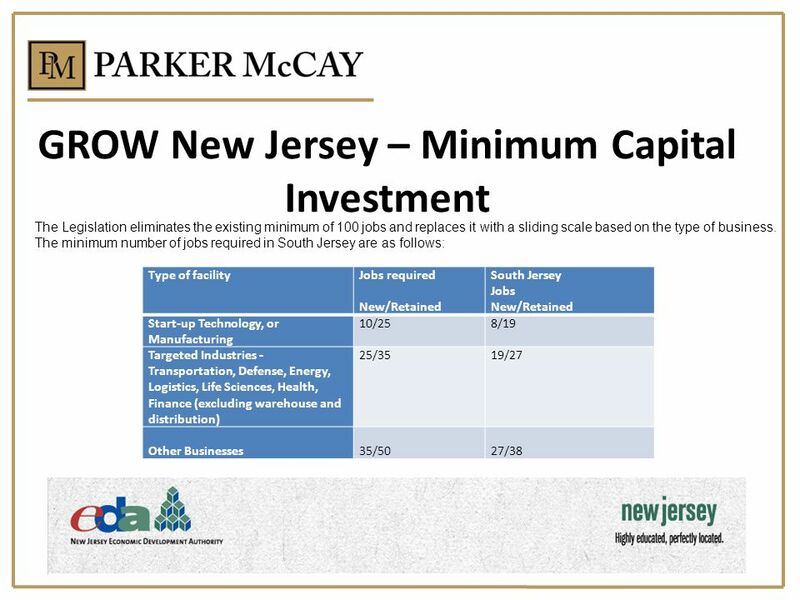 The capital investment must yield a net positive benefit to the State equal to at least 110% of the requested tax credit amount, taking into account the benefits generated during 20 years following completion of a project. In Garden State Growth Zones, the net benefit must equal 110% of the tax credit calculated over 30 years; In Camden, the net benefit must equal 100% of the tax credit calculated over 35 years. 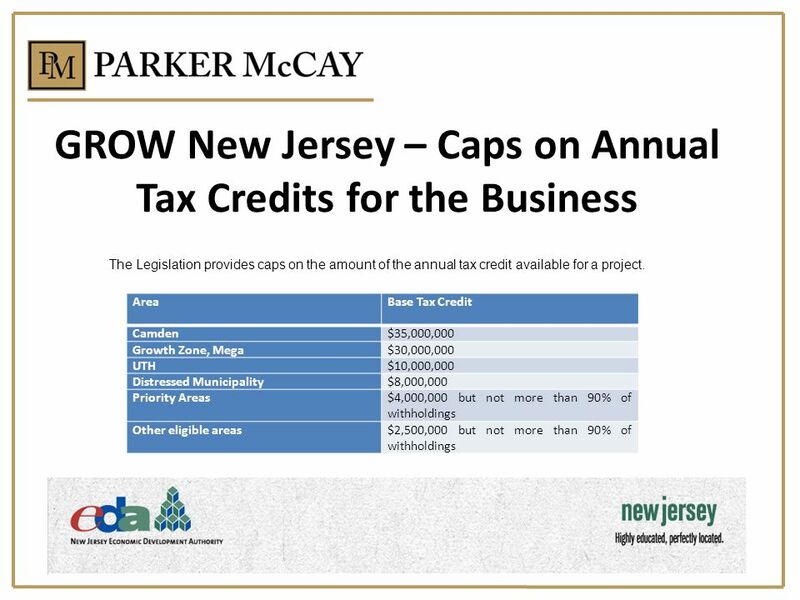 The CEO of a business applying for tax credits must certify that: the jobs are at risk of leaving the state or of being eliminated; and the new jobs would not be created, or the existing jobs would not be retained, but for the tax credits provided under the program. 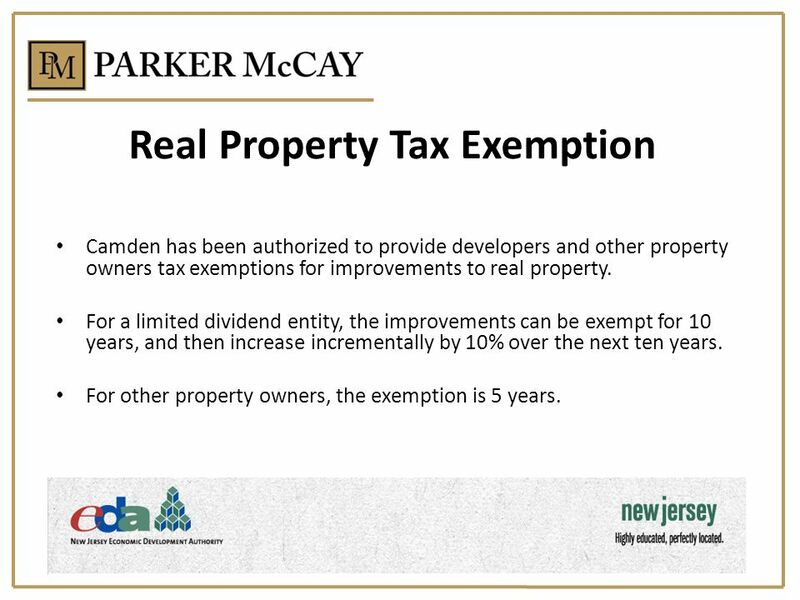 Camden has been authorized to provide developers and other property owners tax exemptions for improvements to real property. For a limited dividend entity, the improvements can be exempt for 10 years, and then increase incrementally by 10% over the next ten years. For other property owners, the exemption is 5 years. 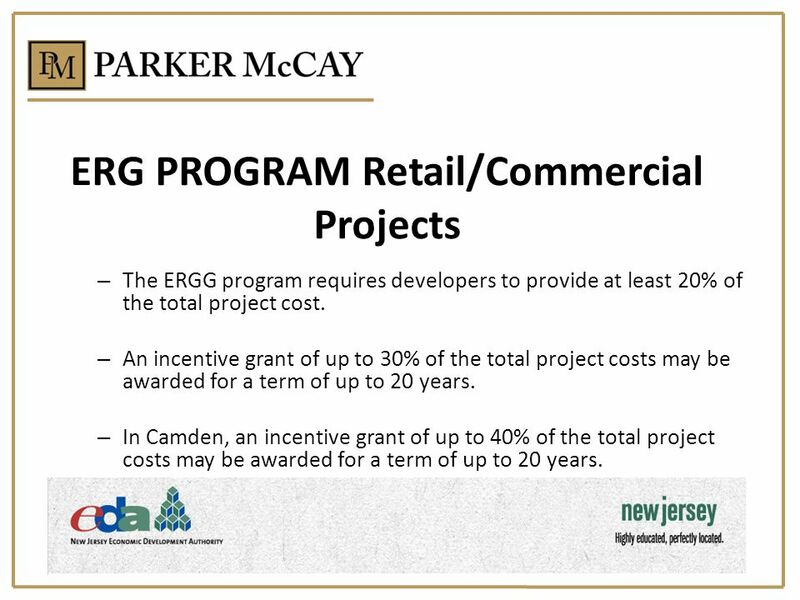 20 ERG PROGRAM ERG grants have generally been used by retail and other developers who are not eligible for GrowNJ financing. 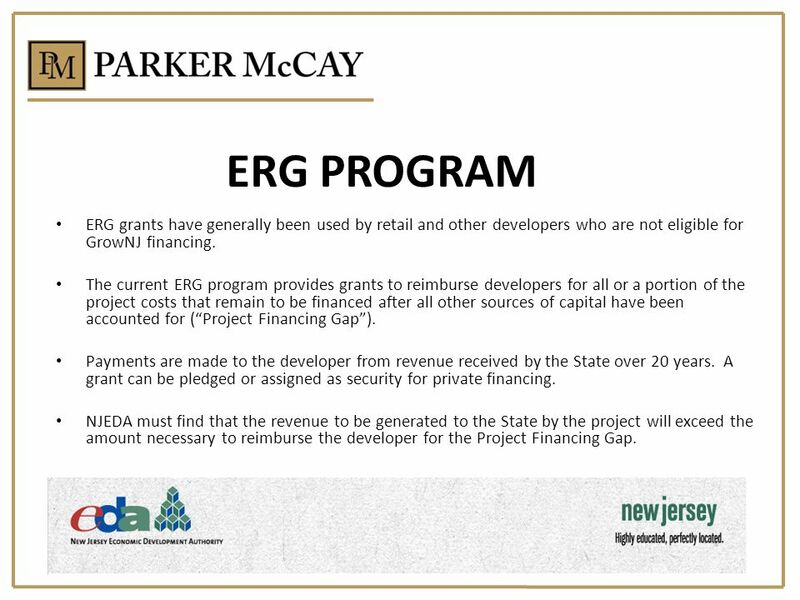 The current ERG program provides grants to reimburse developers for all or a portion of the project costs that remain to be financed after all other sources of capital have been accounted for (“Project Financing Gap”). Payments are made to the developer from revenue received by the State over 20 years. A grant can be pledged or assigned as security for private financing. 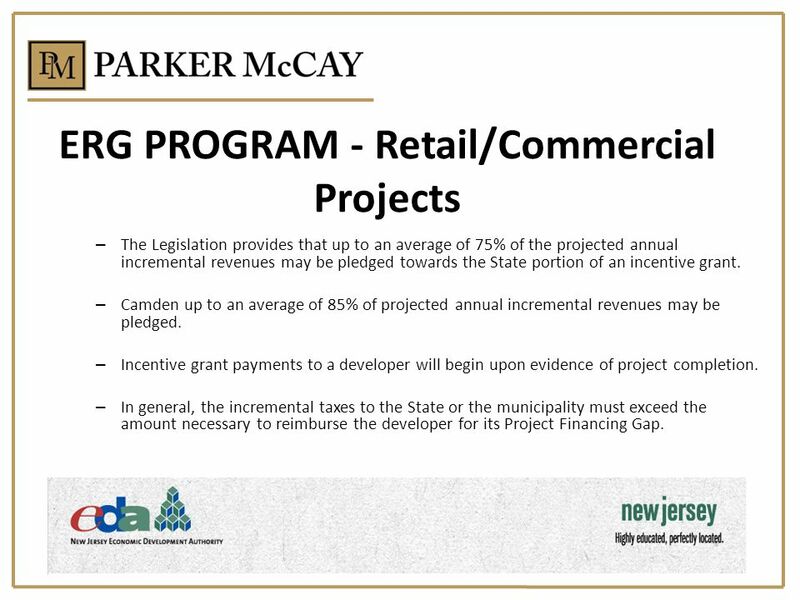 NJEDA must find that the revenue to be generated to the State by the project will exceed the amount necessary to reimburse the developer for the Project Financing Gap. 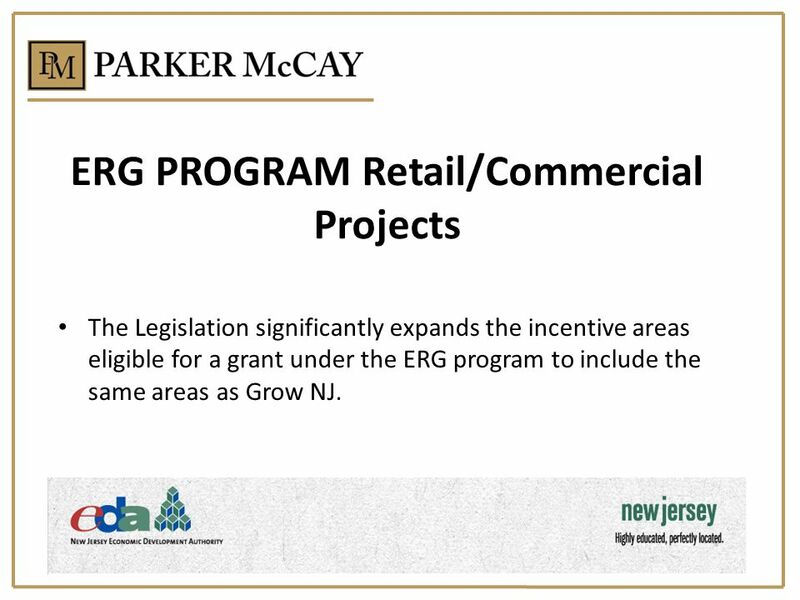 The Legislation significantly expands the incentive areas eligible for a grant under the ERG program to include the same areas as Grow NJ. 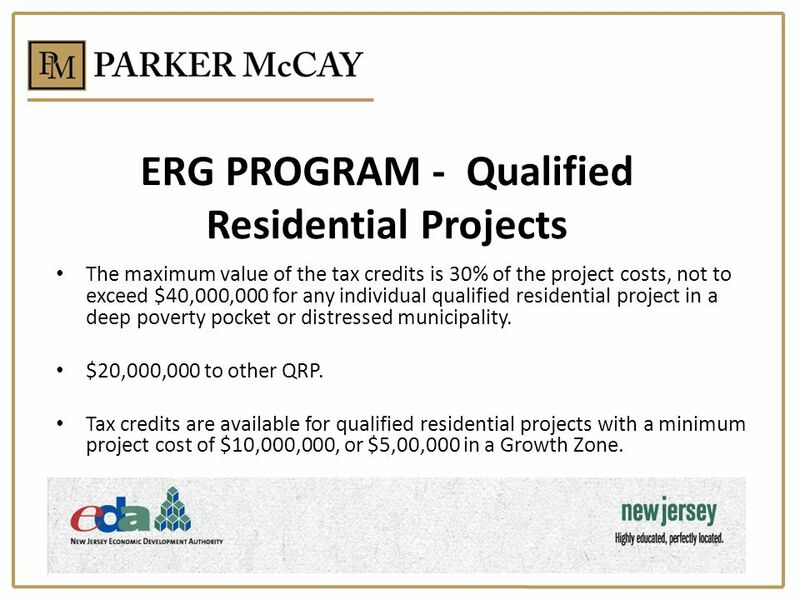 The ERGG program requires developers to provide at least 20% of the total project cost. An incentive grant of up to 30% of the total project costs may be awarded for a term of up to 20 years. 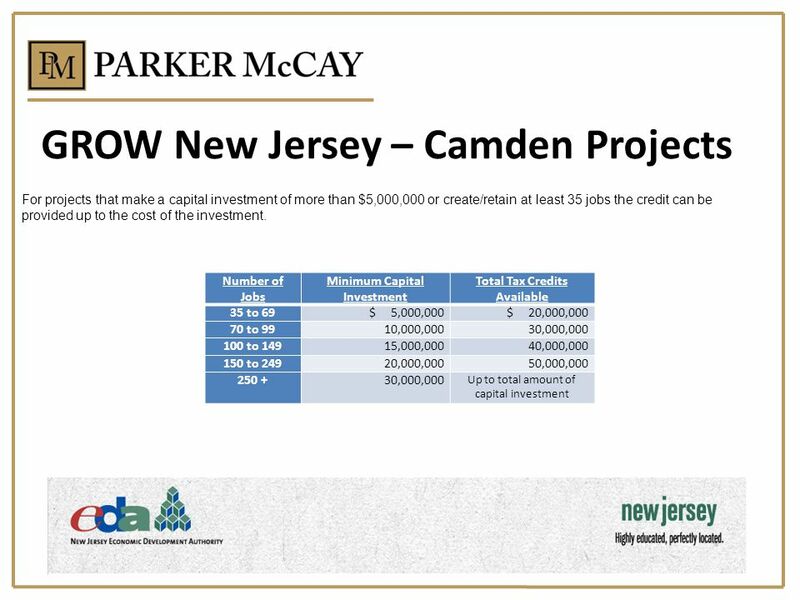 In Camden, an incentive grant of up to 40% of the total project costs may be awarded for a term of up to 20 years. The Legislation provides that up to an average of 75% of the projected annual incremental revenues may be pledged towards the State portion of an incentive grant. Camden up to an average of 85% of projected annual incremental revenues may be pledged. Incentive grant payments to a developer will begin upon evidence of project completion. In general, the incremental taxes to the State or the municipality must exceed the amount necessary to reimburse the developer for its Project Financing Gap. The Legislation provides tax credit funding for “qualified residential projects,” which include multi-family residential units for purchase or lease, or dormitory units for purchase or lease. Funding available for QRP when the incremental tax revenue generated by the project is inadequate to fund the State portion of the grant. $600,000,000 has been allocated to tax credits for QRP. 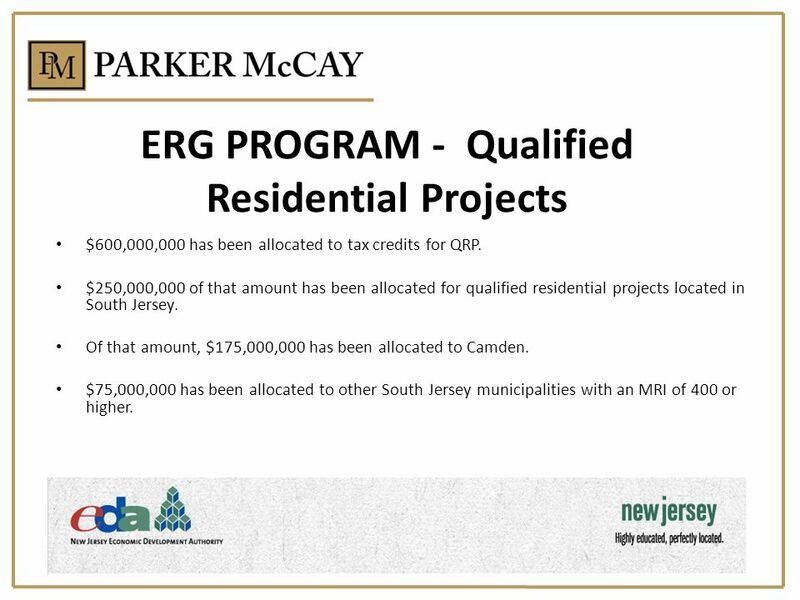 $250,000,000 of that amount has been allocated for qualified residential projects located in South Jersey. Of that amount, $175,000,000 has been allocated to Camden. $75,000,000 has been allocated to other South Jersey municipalities with an MRI of 400 or higher. The maximum value of the tax credits is 30% of the project costs, not to exceed $40,000,000 for any individual qualified residential project in a deep poverty pocket or distressed municipality. $20,000,000 to other QRP. Tax credits are available for qualified residential projects with a minimum project cost of $10,000,000, or $5,00,000 in a Growth Zone. 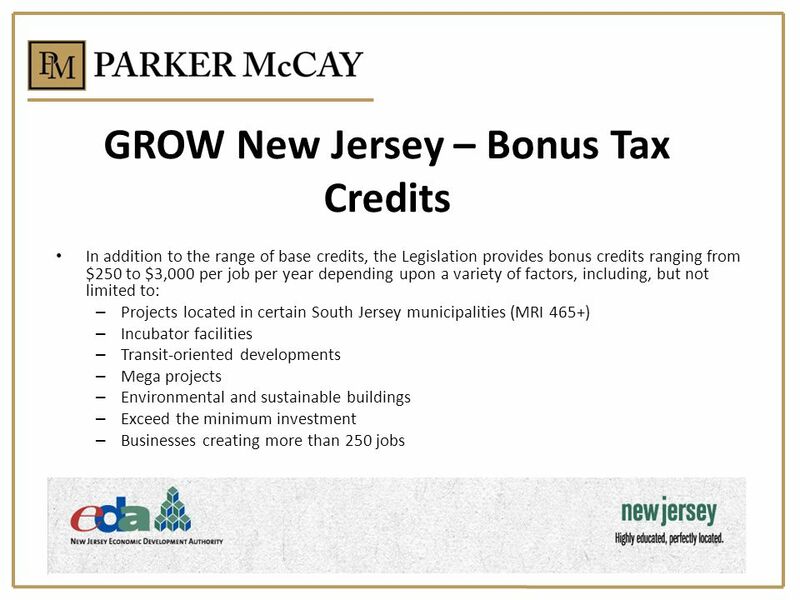 Applications for a GrowNJ tax credits July 1, 2019, and the business must submit documentation indicating it has met the capital investment and employment requirements in the Agreement within three years of approval. EDA can grant two 6-month extensions. 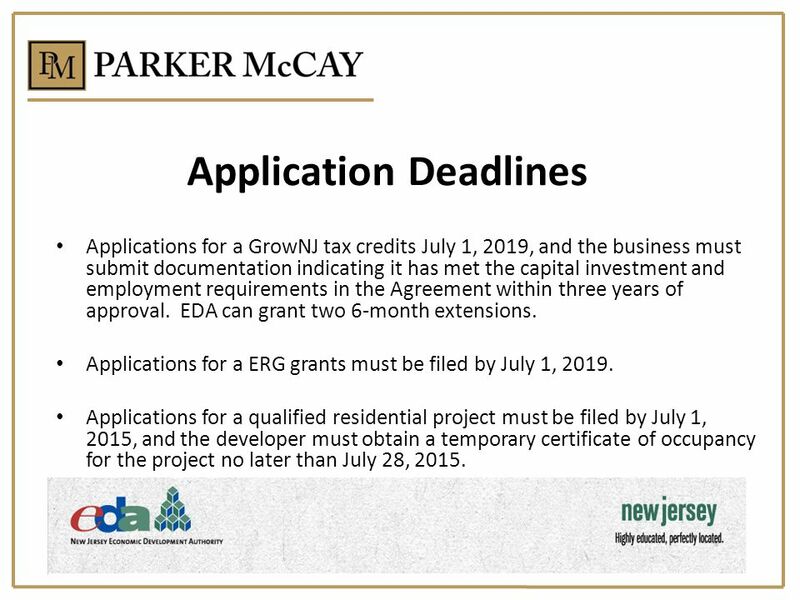 Applications for a ERG grants must be filed by July 1, 2019. Applications for a qualified residential project must be filed by July 1, 2015, and the developer must obtain a temporary certificate of occupancy for the project no later than July 28, 2015. 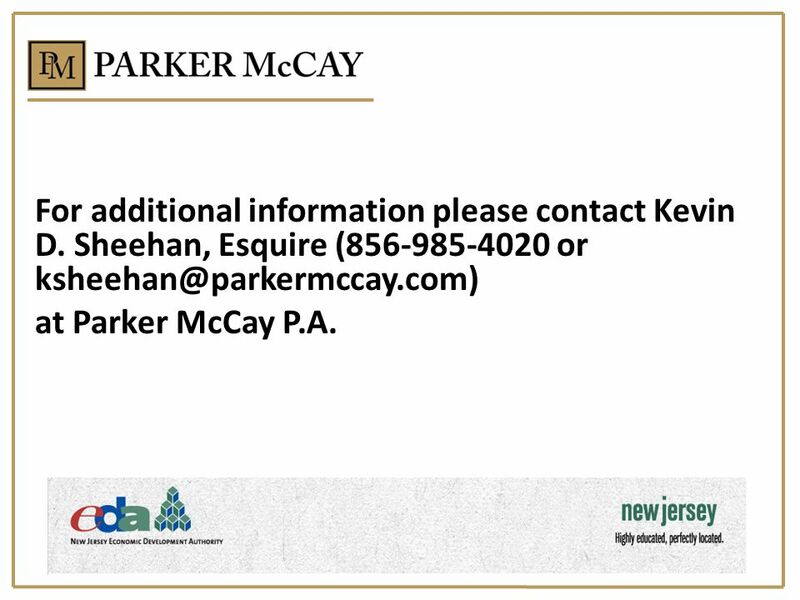 For additional information please contact Kevin D. Sheehan, Esquire ( or at Parker McCay P.A. 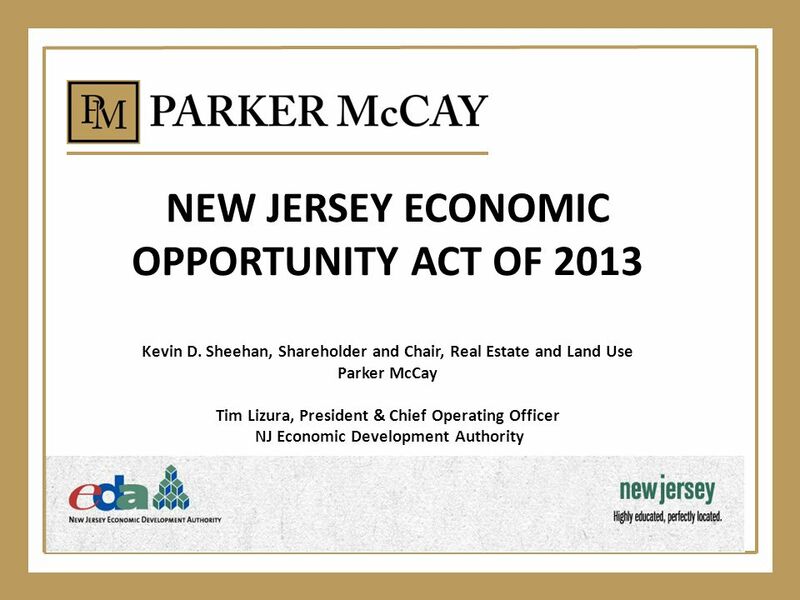 Download ppt "NEW JERSEY ECONOMIC OPPORTUNITY ACT OF 2013 Kevin D"
Supersized: Unique Challenges And Opportunities Of Very Large Brownfield Projects EPA Brownfields Conference (November 3, 2005) Joe Boren Tom Darden Michael. State Aid Programs An Introduction to: Local Bridge Replacement Program Local Road Improvement. Prepare + Prevent + Respond + Recover + Mitigate 1 Credit Resolution Initiative GOHSEPs focus is on proactively working with applicants to: – Identify. OBJECTIVES Reduce the amount of proposed tax increase we are asking from our citizens from.35 to.25 while maintaining current service levels. Where possible.